State Records is working to unlock the information contained within retention and disposal authorities by adopting XML as the preferred format for drafting and publication. Authority Editor is an open source application for drafting and transforming authorities in XML. This application is now freely available for download online. XML is an open, flexible, widely supported and robust format. For State Records, an XML format has several advantages including single source publishing, greater accessibility of approved retention and disposal authorities, and an improved capacity for controlling and managing authorities over time. allowing greater freedom in the choice of tools used to create and manage retention and disposal authorities (such as tools developed by State Records, XML editors, commercial software applications or custom tools developed by agencies and consultants). 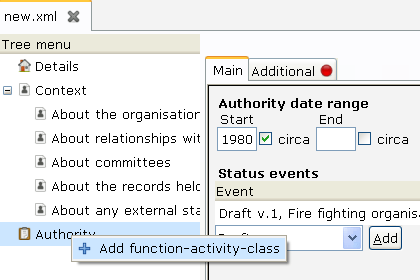 Authority Editor is a full implementation of State Records’ XML schema for retention and disposal authorities. It includes a form entry view with tree navigation for simple inputting of data, a ‘review view’ that provides a readable view for easily navigating and reviewing XML documents, and a transform engine that applies XSL stylesheets to authorities to generate HTML, MS Word or edited versions. You may be interested in using Authority Editor if you are currently drafting, or are about to draft, a functional retention and disposal authority for submission to State Records. Authority Editor can also be used to convert existing approved retention and disposal authorities to XML, for example to take advantage of its export functionality. For more information about State Records’ XML schema for retention and disposal authorities, visit the disposal pages on State Records’ website. To download Authority Editor, visit the Authority Editor website. « We’re all in DRAG!